We often think of Thai food as something we can only order for take-out or eat in a restaurant but this easy beef salad is proof that you can cook Thai at home. 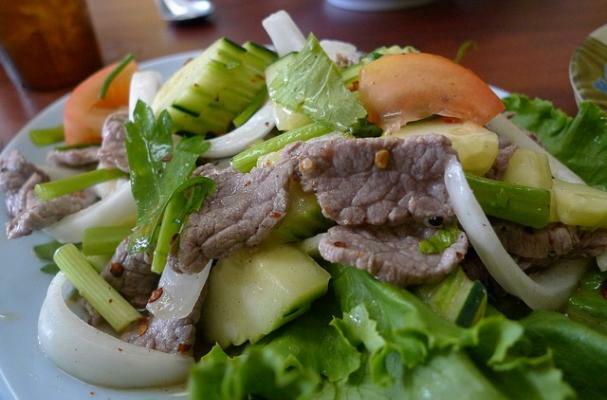 Thin slices of beef are paired with a chunks of tomatoes, cucumbers and onions on a bed of crisp lettuce. The salad is tossed in a spicy, sweet, and salty dressing made from a combination of chiles, fish sauce and sugar. If you are looking to expand your recipe repertoire, this is a delicious dish to try. Thin slice steak, add chilies and garlic, then lemon juice, sugar, and fish sauce, mix together. Remove steak and set aside, mix salad with sauce the steak was in. Place salad on a platter and put steak on top of salad. Serves 4-5 people. Optional garnish 1/2 cup chopped, roasted peanuts.